There are no major economic reports in Japan or the US to influence USDJPY. 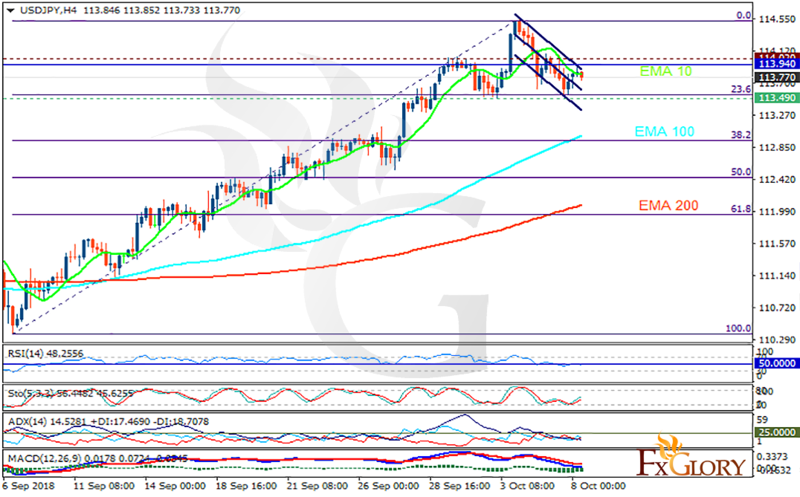 The support rests at 113.490 with resistance at 114.020 which the weekly pivot point at 113.940 is located in between the lines. The EMA of 10 is moving horizontally in the descendant channel and it is above the EMA of 100 and the EMA of 200. The RSI is moving on the 50 level, the Stochastic is showing upward momentum and the MACD line is below the signal line in the negative territory. The ADX is not showing any clear signals. The support level breakthrough can be a good signal showing that the correction pattern has started. In this case, sellers can target 61.8 level of Fibonacci at 112.